Visitors to Yap have a wide choice of accommodations when visiting our islands. From full service resorts with glistening swimming pools to eco-friendly bungalows and quaint seaside inns, there is something for everyone and every budget. Here is an alphabetical listing of our resorts and hotels. ESA Bay View Hotel is a family-run business offering clean and comfortable rooms with reasonable prices that also attract many business travelers. Restaurant on the premises that serves breakfast, lunch and dinner, rental car services and we also offer free airport shuttle. Traveling on a budget? Check into the clean, family-run Hiltop Motel. Free airport shuttle and rental car available. We have hotel rooms as well as fully furnished apartments for those guests coming for a longer stay. Free airport shuttle. Manta Ray Bay Hotel is a PADI 5 Star Resort offering fantastic service and amazing dive sites from a family-run business. Enter a world of authentic charm and genuine hospitality at the quaint O’Keefe’s Waterfront Inn where modern comfort blends seamlessly with timeless tradition. Yap's only traditionally inspired hotel, Oceania consists of eight individual and unique huts that sit nestled into the tropical landscape. Modern amenities go hand and hand with local building traditions and materials. Each room is appointed with organic cotton bedding, ceiling fans, and air conditioning to ensure a comfortable stay. 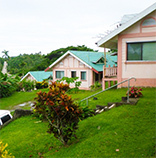 The only beachfront hotel in Yap, the Village View Hotel caters to those visitors that want to escape to a quiet, tranquil village and enjoy the nature and beauty that our island has to offer. Rize Diving Center is our on-site dive shop. Yap Pacific Dive Resort, “Where Adventure and Luxury Meet”. Here you can enjoy world-class scuba diving and instruction in our SSI and PADI approved dive center by day, and gourmet dining & exotic island drinks in our restaurants at night. Relax by our fresh water pool or spoil yourself at our private massage retreat offering a wide range of popular spa services! YCA Apartments are centrally located in Colonia within walking distance of stores, bars and restaurants. Short and long-term arrangements available. Choose from several studio layouts with lagoon views, private balconies and hillside location.